I would of like to know that the sticky pad was strong enough to hold my at any given angle and not fall off as it has done several times and nearly damaging the phone in the process. I have since had to angle the phone so it caddles it slanting forward, it OK but falls off from time to time. Support is only at the bottom or one side so it is quite easy for the phone to fall off unless the holder is tilted well back. Doesn't work on the windscreen of a 3 series BMW due to slope of windscreen, can't fit the phone in. Very disappointing as otherwise looked well made etc. Haven't tried in another car so might work for others. Haven't tried to return it as nothing wrong with it otherwise, will look more closely at an alternative product! Didnt realize it uses a gel sticky pad to get the phone attached to the holder, and there are no clips. Nice idea and I would prefer this but I don't think the gel stickpad is going to last long. Already my phone has fallen off the mount a couple of times. This mount does 'exactly what it says on the tin.' It grips both the dash and phone extremely well and holds firmly over even the roughest roads. Completely adjustable and a very competitive price make this a No.1 must-have accessory. Great mount. Suitable for all my devices and seems to work on all surfaces, even dimpled ones. Grips both phone and dashboard like a clam! Great value for money. My car windscreen is too steep to hold my phone in a vertical position and the dashboard has no flat surfaces to hold the device. The arm attached to the ball joint is too short to allow full adjustment on the windscreen. Good idea but didn't work for me. This product is a total failure and if Mobil Zap wants to stay credible and have products that can be trusted, I am asking for a refund. It did not even work for a whole day. After using it for a day of driving, I don't know how long the sticky pad will last. it seems to be less sticky already. I think the magnetic disk is a much better idea. This holder did everything that I wanted as described in the advert. Excellent buy. I like the dash genie. It stays in place and keeps my phone in place as well. It is what I needed. I am really happy with this product. My phone attaches to it well. The only thing is that it's tricky to get off the windscreen so I leave it on the windscreen and pray that no one breaks into my car thinking I've got something in the glove box worth taking...! I am happy with this though and spent a long time deciding which phone holder to buy. I bought this unit as it was recommended by Autoexpress. It arrived quickly and I was impressed by the small size. Assembly was quick and the unit attached firmly to the dashboard. It could also be removed and repositioned easily. The sticky pad for holding the phone is very effective just by placing the phone in the unit. Removing the phone can be a two handed job as it sticks so well. I've only had the mount a short time so i will have to see how this settles and whether the sticky becomes less clingy. Altogether I think the unit is worthy of the recommendations. This phone holder was delivered quickly and we'll packaged to my home address. The original was missing a part but the returns process was simple (and free) and the replacement was with me quickly. I highly reccomend it for commuting and leisure, it holds my phone steady and is adjustable as described. Thanks a lot! Really happy with product, would recommend. Really happy with the product but one issue I do have is that the sticky pad stays stuck to the phone when I remove it from the holder. I have had to super glue the sticky pad back to the holder to prevent this happening. Otherwise this holder was just what I required and have not issue with it adhering to dashboard or windscreen. Would recommend this product and MobileZap. Firstly, the suction base sticks like a limpet and keeps the phone holder rock solid so top marks there.The sticky pad that holds the phone worked fine on the phone back case (smooth plastic) and even in sharp turns the phone stayed put (good as it's a 5.5inch screen phone). Not so good with a silicone gel phone protector fitted which has a slippery finish and I lost the phone a few times. I overcame this by sticking a 1mm thick strong magnet above the sticky pad and putting another inside the protector. Overall I'm very impressed. Read this if your phone is more than 10cm long and you want to use a window mount position. Unless you have an almost vertical windscreen this will not work because the connecting arm is so short the phone cannot stand upright. I have tried it in two different SUV's and three saloon cars and none will allow a window mount with the phone in the vertical position. Has been two weeks after I put it in my car . This is it. Rubbish It's not stick any more. Items arrived today 7.1.2017, order placed on 15.12.2016? Consider that a quick delivery time for the Xmas/New Year holiday period here in NZ. Just so neat and simple! So many car phone holders have various jaws, claws and brackets to make a specific phone fit that they end up being ugly. The Genie v2, on the other hand is simplicity itself and all the better for it: Whatever model of phone you are using, it will not obscure any of the buttons or connections, you just end up with the phone apparently hanging in mid air in front of you! The red dot grips the back of the handset, at first maybe a bit too strongly, I once pulled it off, but it goes back where it belongs easily enough. Unlike many phone holders that I have had, the suction of the base of the Oliver has never came loose or fallen off. I would strongly recommend this one above all others. Having just bought a Sony Experia, I tried to sort through the minefield of different in car holders, worrying about which ones would leave the side buttons clear and still allow connection of the USB lead. So many of them are ugly, with various claws, clamps, arms etc., so when I saw the Dash Genie v2 I was immediately taken with its simple, unfussy appearance. At such a reasonable price, could it work as well as it looked? The answer is yes, my phone just sits there and I have no worries about it slipping, having used it extensively recently. Speed bumps, winding country roads etc no problem! Product is of good value, however, when assembled for first use, the adhesive bottom (which sticks to dash/ windscreen) kept un-sticking from the dash after a couple of minutes of holding the weight of my device (Sony Z5 Compact), meaning I was trying to re-apply to dash every few minutes, until I moved the Dash Genie to another spot on the dashboard - now appears to be more stable when in use! Firstly, the base only stays put if it sits on a very flat surface. Any curvature at all and it won't be happy. The sticky pad that holds your phone in place is also less than perfect, so the lack of any clamps on the side to hold the phone means it flies out of the holder on occasion. However, when it does work it holds the phone fairly well, exhibiting good levels of stability on rough roads, making the screen easy to read. Great little phone holder.. Really sticky pads for window and phone. Good because it has a little shelf which makes it easier to manage when placing on and off all day. As a temp truck driver I'm always moving from vehicle to vehicle so It's small, light volume makes it great for my over-stuffed work bag. Great simple to use Universal in-car holder for my iPhone 6 Plus, which the holder manages to cope with the size of! Watch the sticky Holder for the phone back as this sticks like cement and can be difficult to get the off the Holder!! Holder is secure, sticks on a surface and stays there without worry. Only concern is the sticky part on which the phone rests on itself, it loses it's stickiness fast but the actual holder which rests on the car/surface itself is high quality. Very pleased with our purchase. Works excellently on textured dashboard. Great suction. Would highly recommend. I like the idea of this but unfortunately the "sticky gel" came out of the holder (stuck to the phone case). It is essentially not much use to me now although I can press the gel back into the holder, it comes out each time I remove the phone. I had previously used the iBolt iProDock 5 which worked very well, but now with an iPhone 6s and LifeProof case the iBolt doesn't open wide enough to hold the phone when in it's case. Very pleased with our purchase. Very good suction and works very well with a textured dashboard.. Would highly recommend. Purchased as a replacement for my old one that broke after many years of good service. As it states easily portable from vehicle to vehicle which is great if like me you hire vans/cars for work. Grips all dashboards that I have used it in. Holds my note 3 when using it as a sat nav with no problems. I recently bought my Olixar Dash Genie v2 Universal In-Car Dashboard and Windscreen Holder and am very pleased with it. It is very easy to install and holds the phone securely in either the vertical or horizontal position. The phone can also be twisted to enable easier viewing. It will be interesting to see how long the sticky spot lasts. I consider this product great value for money. After a short time of use I feel, that the product fits well for it's purpose. It us easy to install. I used a little contact glue to make sure the holder doesn't disengage. I can recommend the product. I purchase this in car holder to hold my Blackberry Passport. I wanted something easy to use and with abaility to be movabel from one car to the other. I am very pleasedwith it. It holds my Blackberry Passport in place wiht no problem (and it is a heavy device compare to a normal mobile phone). The ratary ball mean you can angle it the way you want 360 which is great. Really pleased with it. The most convenient mobile holder I've used so far. The build quality us also above par. Don't think I would wanna try out anything else from now on. The profile of my Subaru windscreen won't allow my iPhone6plus fit into this mount. Don't buy for iPhone6plus it's too small. The suction pad that attaches to the dashboard is very good but the red adhesive area that holds the phone fails after a few minutes. Vibration results in loss of adhesion and connecting a power lead also causes the phone to leave the holder. I'm looking for an alternative but suspect I'll have to consider Brodit again despite the cost. Great little holder. It can come off the dash after extreme heat but is easy to put back, I usually clean and wet the sucker. I leave it situated on the dash permanently. I thought it had lost its 'stickiness' - the red gel which the devise is held on by, but contacted MobileFun and they told me to wash it with a spot of washing up liquid and it's back in service. The red gel area does start to look a little untidy/dirty after a long while and I haven't managed to clean it. Overall it's great and I'm buying another for my 2nd vehicle. This mobile holder works very well. I was a bit sceptic before I got it if it would attache to the surface, but it does. Great product. It was easy to put together and attach to the dash. Great product... no cumbersome sliding side clamps and foam pads. Works via sticky pad and bottom lip. Sticks well to textured dashboard too. I have tried a number of different phone/satnav holders over time, but this one is the best I have used. It,s piece of cake to set up And I have tried it on the dash in different positions including on curved section,no problem. I am using it to hold an iphone5 using GPS software. The other thing is it hardly wobbles, unless it is very rough road.All in all this is brilliant piece of kit and good value, which I would reccomend. My Galaxy S3 kept falling off, or the whole thing fell off, so not good. Would be ok with a small light phone. Very satisfied with this purchase. Looks great, fits perfectly, and allows for easy attachment and removal my phone. Sticks with good adhesion directly to the dash, it's been a couple of weeks now and it hasn't looked like coming away. I use my Samsung S5 as my sat-nav and need something sturdy to keep it in place - my phone has fallen off this holder SO MANY TIMES when navigating. Very frustrating and dangerous when on a motorway and my phone has fallen off. Now ordered the Kenu Airframe instead. ........for your car, but when off road driving the phone can become disconnected from the holder. The harsh ride which caused this is way beyond anything which should be encountered when driving on tarmac. Sticks to the dashboard like a limpet! A little problem with the phone mount as my phone kept falling off after about 20 mins. I was mounting the phone in portrait and then turning through 90 deg to get landscape operation for a satnav app. When I put the phone in landscape first, so that the cradle clips were at the bottom, the phone stayed in place. The picture on the back of the product packaging appears to show the cradle in a horizontal position when in use. this is the best holder I've tried, it stays on the dash, it's not big so doesn't obstruct your view, will hold a small to medium or a light weight large phone, needs a larger sticky pad to hold a heavier phone, my HTC one m8 stays put in portrait position but falls off in landscape positio hence only 4 stars , I'm very pleased with the dash genie. Does exactly what it said it would do & even holds the IPhone 6 plus. I have a corsa, and this phone holder will not stick any were on my dash, I will be looking for a different one. Just what I wanted to hold my Galaxy S2. Work's a treat! The best phone holder i'e ever bought. Excellent product which i guarantee you wont be disappointed with. I was a bit worried that the phone wouldnt be that secure but after living with it for a week i'm absolutely made up with it. My Z3 is a big phone but its rock solid on the Dash Genie which is mounted on a curved part of my dashboard so its really unobtrusive. Top product. Dashboard Genie looks good and is a neat size. Mounted it with my smart phone on the clean dust free car dash and off we went driving into the sunshine. Thirty minutes later the contraption fell off the dashboard. I then held it in my hand by the stem, while using the phone as satnav. Then the phone fell out of the cradle. I do not think the adhesive and suction are strong enough. Works really well and a great price. Exactly what I was looking for. It sticks easily to the dash (and can be removed just as easily), the phone sticks tightly, and it swivels for the best viewing position. Great price and only a week to deliver to my rural location in Australia. Highly recommended if you want a holder that has a low impact on your car, holds tight and doesn't leave a smear on your windscreen. Easy to fit, easy to use. Works great with my HTC one in its Otterbox case. This simple device is perfect. Sits neatly on my dashboard and holds my larger than average mobile, Nokia 625 securely in place, does not fall out over bumps or when I swerve or go around corners. Sticky pad really holds tight. I can turn it to help me use my phone as a Sat Nav. When my daughter used my car, she poped her iPhone on and was so impressed, she wants one. I can view screen really well and tilt as needed. Can charge phone whilst it sits tight on this device. Worth the money and arrived very quickly... Don't laugh but thinking of getting one to use on my office desk :-) ! In place in a dash! I use this with my Apple S4 phone. Really pleased with this piece of kit. Effortlessly easy to fit and does exactly what it says. No movement, no sticky residue and can be used in portrait or landscape. One very happy customer. At last a car mount that works. Sticks like cement to a dashboard, although it shakes a little, this is the car's suspension's problem not the holder. On the windscreen this baby is perfect. Really impressed. Mobilefun kindly exchanged the original car holder I ordered because it was incompatable with the space available in my Yaris. Unfortunatly this holder was unable to support the wieght of a large smart phone because the adhesive area is too small and so will need returning again. 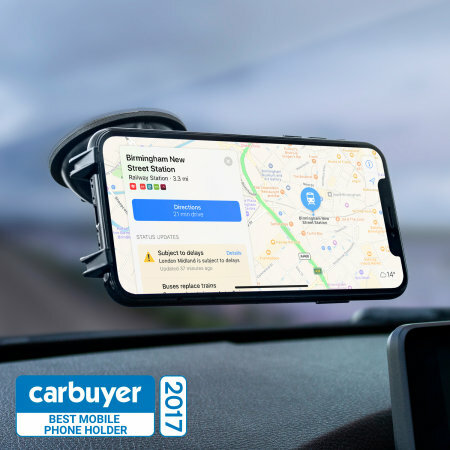 I needed to get a mobile holder for the car and looking at other usual popular sites for ages and couldn't find what I was looking for until I was recommended by a friend to try this site. Found what I was looking for in 5 mins just put the make and model of phone and what I was was searching for. I read the other customer reviews some were great and a few were not ,so was in two minds to purchase the item but as a friend recommended the site I did and so glad as had no problems and used this site a few times and will again. first time used mobile fun very impressed with the service from start to finish. Would not hesitate to recommend to friends. I did not think it would hold a large smart phone so well really sticky may be too sticky at first but becomes easier with use.The base has an equally firm fixing and the whole thing is compact.Very pleased. This may be a universal holder but the LG G2 does not stay on it. It will stay for about fifteen minutes after having cleaned the back red sticky pad, but then dislodges. This is with a case on the phone, and I have not tried it with the case removed. Two star rating as the unit stays extremely well on the dash - it's just the phone holder part that is the problem. Smaller/lighter phones and without the case maybe ok - but not tested that out. Spot on, just the job. Great little bit of kit, with rubberised suction mount on the base. Had this a week now and its still not moved or fallen off. We also use it for the satnav. You can have the phone in portrait or landscape without having to adjust the mount, it just sticks. Fits well on a curved dashboard and holds the phone easily in portrait or landscape without any need to remove the phone from its normal case. Haven't yet been using it long but if it continues like this I'm delighted. I watched the video again which seemed pretty good and it completely acted like the video in real life. The phone sticks to it really well, the sucker works brilliantly. I do wonder how long the stickiness will last (just add water it says on the video - time will tell on that one). I have a large phone in a ballistic case, so it is pretty big, moderately heavy, wide and it stuck on magnificently. The suction cup worked really well on my curved dashboard. The phone didn't wobble at all when going around bends. It really is a great buy. As such it would fit any phone of any width. You will not be disappointed. Simply will not stick to my dash or windo. At one stage i got it to stick put ny phone in and the whole thing fell on top of me. Am very unhappy with this product. I do a lot of driving so will now need to find another product to suit my needs. I tried this out in the obvious ways, but none of them would stay stuck and support my phone in landscape. However, when I tried it as per the third picture on the front of the packaging, it actually worked! It's better than what it replaced because it's easy to keep the charge connector clear, and the phone stayed put, with the holder remaining in place, the whole time. I hope this hint helps others. This will certainly do the job for me.